Seafood Gumbo is my very favorite gumbo of all and I just don't get enough of it. Since I moved away from Louisiana, I don't have access to the seafood ingredients like I did before and I am spoiled. I don't do well with substitutions with this recipe! But, if you've never had it before, you won't notice like I do, particularly since I am a "foodie"! 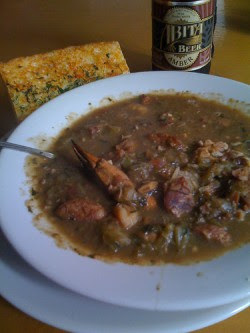 This is a tradtional seafood gumbo recipe that is a staple in South Louisiana homes particularly during the Lenten Season. There are so many different versions/variations of gumbo recipes, but this is a tried and true, easy recipe to make. Whatever you do, do not substitute fake crabmeat or Alaskan King Crab leg meat for the real claw or lump crabmeat; it's just not the same. The crabmeat and oysters can usually be found in the grocery store butcher section or specialized frozen seafood section. If you can't find crabmeat, find some uncooked whole crab (or claws), clean them and drop them in the pot! Cest Ce Bon! In large pot, combine oil and flour and make a dark brown roux (see Tips and Information on how to make a roux). Add onion and stir well; then add okra and blend well. Add all other vegetables except tomato and allow to cook down, cover if necessary to retain moisture. Add about 4 cups of water, tomato, and seasonings; blend well. Cook down for about an hour and a half adding more water if necessary. Recheck seasonings. Add oysters and shrimp, stir and cook about 5 minutes. Fold in crabmeat and remove pot from heat. Cover and allow to sit about 5 more minutes. Serve over rice.